Liver stage Liver-stage development was reduced as shown by a 1-day extension of the prepatent period in mice following the inoculation with 10(4) purified sporozoites. While gliding motility and the rate of cell traversal of sporozoites were similar to wild type parasites, in two out of three experiments a reduction in sporozoite in vitro invasion rates was observed that could explain (in part) the delay in the prepatent period. Immunofluorescence analyses of liver stage parasites stained with antibodies against markers for parasite development (HSP70), PVM (UIS4 and EXP1) and merozoite formation (MSP1), revealed no distinct differences in morphology and size between ∆rom1 and wild type liver stages at 24h or 48h after sporozoite invasion. 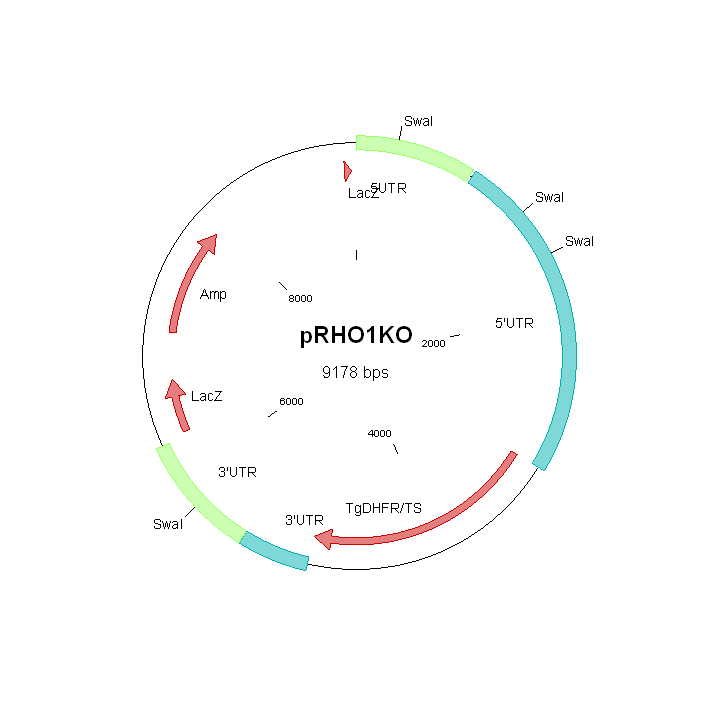 The mutant lacks expression of the rhomboid protease ROM1. Rhomboid proteins are intra-membrane proteases that play a role in multiple processes. They belong to a family of serine proteases that cleave cell-surface proteins within their transmembrane domains. The Plasmodium genome encodes a total of 8 rhomboid proteases (ROM1, 3, 4, 6, 7, 8, 9 and 10). ROM1 is expressed in both the blood stages and mosquito stages (sporozoites). ROM1 was localized to organelles of the apical complex of merozoites. In vitro substrates of P. falciparum ROM1 include the merozoite-specific proteins AMA1 (apical membrane antigen 1) and proteins of the EBL (erythrocyte binding ligands) and RBL (reticulocyte binding ligands) families as well as several proteins of the invasive ookinete- and sporozoite-stages, such as TRAP (thrombospondin-related anonymous protein), CTRP (circumsporozoite- and TRAP-related protein) and MAEBL (merozoite adhesive erythrocytic binding protein). The phenotype analyses indicate that ROM1 is not essential throughout the complete life cycle in P. berghei. Liver-stage development was reduced as shown by a 1-day extension of the prepatent period in mice following the inoculation with 10(4) purified sporozoites. It has been reported that P. berghei and P. yoelii mutants lacking ROM1 (see mutants RMgm-176, RMgm-659) exhibit a slight growth delay and appear less virulent in mice than wild type parasites. In contrast, the ∆rom1 mutant described here and in RMgm-761 neither a growth nor a virulence-attenuation phenotype have been detected. Mice infected with ∆rom1 parasites showed a normal course of infection and all C57BL/6 mice developed clear signs of experimental cerebral malaria (ECM). The cause for these discrepancies in blood stage phenotypes between the ∆rom1 P. berghei mutants described here and in RMgm-761 and the mutant RMgm-176 is unknown. In RMgm-176 the mutant clone examined was derived from a single transfection experiment. Although a significant reduction in expression of UIS4 has been reported for liver stages of P. yoelii mutants lacking expression of ROM1 (RMgm-659), the ∆rom1 parasites showed only a slight, but not significant, reduction in liver-stages as determined by UIS4 staining and the liver stages of the ∆rom1 mutant had no unusual parasitophorous vacuole membrane as reported for the P. yoelii mutants. Liver stages of ∆rom1 and wild-type parasites were also comparable in size at 48 hrs post infection.